Some people love the characteristic odour of garlic while others hate it, especially when they smell it on their breath, the breath of their loves ones or their neighbour on the bus. 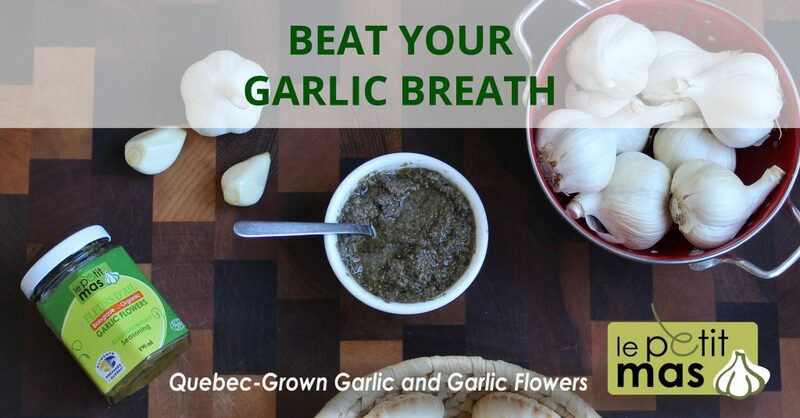 In this first instalment of our Garlic Myths and Realities series, we will try to better understand what causes garlic breath so that we can fight it better! Allium sativum—garlic—is known for its many beneficial properties. To benefit from its “miraculous” molecules, you need to crush, mince or chew the garlic to trigger the chain reactions that transform the alliin into allicin and other organosulphur compounds, such as diallyl disulfide, allyl methyl disulfide, allyl mercaptan, and allyl methyl sulfide. Certain molecules are good for the health, but they also release malodorous gases in the oral cavity. Most of these molecules quickly break down in the digestive tract, EXCEPT allyl methyl sulfide. This malodorous molecule takes longer to metabolize. It spreads through the organism and thus spreads its characteristic odour in the respiration, sweat, and even urine. Part of the odour responsible for garlic breath comes from the oral cavity, so brushing your teeth thoroughly or rinsing out your mouth with mouthwash will get rid of some of the odour. However, this might not be enough. According to the Journal of Food Science, these foods contain an enzyme which causes chemical reactions that reduce the formation of allyl methyl sulfide, as well as directly reducing odours. Fight garlic breath: drink milk! Another study by the Journal of Food Science  found that milk is very effective in the deodorization of allyl methyl sulfide. Whole milk obtains the best results, since the fat content is partly responsible for deodorization. Furthermore, drink the milk during the meal, since it will act directly on the volatile molecules created while eating. In some recipes that contain garlic, you can substitute fermented garlic flowers for garlic, since they are much easier to digest and won’t cause garlic breath! You don’t have any fermented garlic flowers on hand? Find the point of sale nearest you. Looking to have some Quebec-grown garlic? Buy your Quebec garlic from our online store in season. Effect of milk on the deodorization of malodorous breath after garlic ingestion.